The Little Cutie doll was designed and hand crocheted by me (CrochetCuteDolls). Amy has wild hair that is made with a fur yarn. 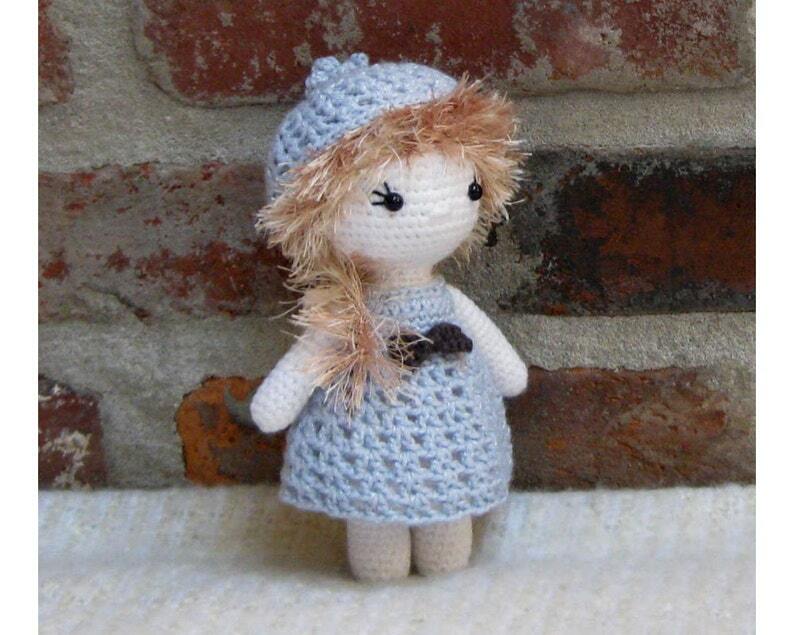 She wears a light blue dress with a little bow and a hat that is removable. I had a lot of fun designing and crocheting this doll girl and I hope she will find a lovely new home! Beautiful design! Cute as can be! I accept PayPal and credit card payments as direct checkout. Please make payments for your purchase within 2 days. If you experience any problems, please contact me. If payment has not been received after 3 days, I reserve the right to cancel the transaction and re-list the item. Digital patterns are not exchangeable or refundable. I can only accept cancellations for physical items before they have been shipped. Every physical item I send is double checked to make sure your item reaches you in perfect condition. Please contact me if there is an issue with your order upon arrival and I will resolve any issues on an individual basis.I will be happy to refund your payment at the purchase price if you are not 100% satisfied with your toy. I will refund the full purchase price upon the return of the item. You will be responsible for the returning shipping costs and making sure the item is sent in appropriate packaging in their original condition. Digital files are available as instant download once payment is confirmed. Physical items will be shipped in 1-3 business days. All items are shipped through the US Postal Service as First Class Mail or Standard Post. If you have special requests like insurance or expedited shipping, notify me before making payment so that extra postage can be added. I will always email you as soon as the item has been shipped. Delivery time is out of my control but you will be provided with a tracking number to keep up with your mailed item. Your order will be shipped to your Etsy's address. Please make sure your Etsy account address is valid and updated to avoid any delays in delivery. If you are located outside the US and want to purchase one of my amigurumi dolls, please contact me before buying so that we can work on the shipping conditions. Please be aware that computer monitors might show the colors slightly differently.